Thanks to a run-in with General Traag from Dimension X, the Turtles discover that Krang is experimenting with his “Dimensional Portal” again. Donatello decides to contact the Nutrinos in an effort to discover what Krang is up to. Donatello’s “Pan-Dimensional Portal” is knocked “off track” by Krang’s machine and instead of Dimension X, the Turtles make contact with an alternate Earth, in 16th century Japan, where animals are the dominant species — not humans. Suddenly, a samurai rabbit named Usagi Yojimbo is “sucked” through the portal and into the Turtles’ Lair. After a short battle, Usagi admits defeat and begs to learn their ninja secrets. 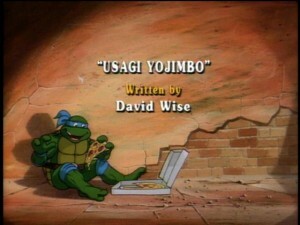 Splinter recommends that Usagi be returned to his own time/universe but Donatello tells him that it may be impossible. Their sense of “giri” (duty, obligation) prevents them from turning him away. The Turtles and Usagi head over to Channel Six News to learn what’s happening as a result of Shredder/Krang’s “Inter-Dimensional” experiments. April suggests that they try mid-town, and sure enough, they arrive just in time to encounter Foot Soldiers, from Dimension X, exiting a portal. When Usagi learns that the Foot Soldiers are the Turtles’ enemies, he makes the Foot his enemies as well, and proceeds to destroy them all. Donatello retrieves one of the Foot Soldiers power packs which he plans to use to hone in on Shredder’s power source. Donny returns to the Lair, while Usagi chases a motorcycle (believing that it is another robot) across town. Meanwhile, Shredder continues to flood the city with Foot Soldiers, sending the local populace into a state of panic. Back at the Lair, Donatello tracks the Foot Soldiers as they all converge on the Far Eastern Animal Museum which houses a collection of mystical oriental relics — all relating to animals. Splinter believes that whatever Shredder is after will only lead to evil. And sure enough, the Foot Soldiers break into the museum steal a giant egg, abduct the museum’s caretaker, and head for the Mid-Town Power plant where they lower the egg into a giant smokestack. Meanwhile, Michaelangelo tracks down Usagi at a rabbit-themed restaurant, where the Ronin believes he is freeing his fellow rabbits from slavery. The Turtles, Splinter and Usagi arrive just in time to witness the smokestack explode. When the smoke clears, a giant dragon is revealed. Splinter, Donatello, and Usagi follow the Foot Soldiers, who were guarding the smokestack, and locate the missing Museum caretaker, Obento, while the other Turtles stay to “baby-sit” the dragon. Michaelangelo decides that the dragon might be hungry and “slices” open a nearby grain elevator. The dragon eats till its’ full, only to double in size! Back at the power plant, the local militia have their big guns trained on the giant dragon. Obento asks which of the Turtles is brave enough to place the “Blue flame of Osaka” into the giant dragon’s mouth. No one volunteers until Usagi steps forward. Before the General can order “fire,” the giant dragon reverts back to his egg form. Obento is indebted to Usagi and offers to protect him from harm until Donatello can find a way to send him home.